The performer hands the spectator three American coins for examination. A quarter, a dime, and a nickel. After the spectator is convinced the coins are real, the performer asks for the quarter and the nickel. At the performers finger tips, inches away from the spectators eyes, the nickel is balanced on top of the quarter, edge to edge. The performer then proceeds to ask for the dime. The dime is then balanced on top of the nickel. 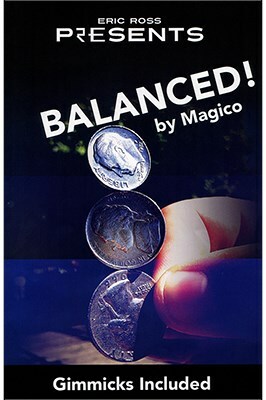 In a very clean display, the three coins are balancing on each others edges, right in front of the spectator. The performer snaps his fingers, and the coins fall right back into the spectators hands. NOTE: This effect only works with American coins. Comes complete with gimmicks needed.